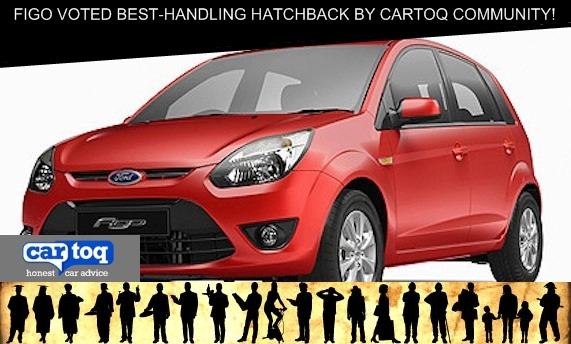 In a CarToq online poll that ended yesterday, Ford Figo has been voted the best handling diesel car under Rs. 5 lakh, beating Maruti Ritz to the top spot. The other cars in contention were the Chevrolet Beat and the Tata Indica eV2 – all these diesel cars cost less than Rs 5 lakh and give an excellent mileage of over 20kmpl. Of the total 412 CarToq.com community members who voted, 41% voted in favor of the Figo. The Maruti Ritz was next at 29%, followed by the Chevrolet Beat at 23% and the Indica came a poor fourth. The results validate feedback from Figo owners who have always raved about the car’s handling. And car experts have also acknowledged that this is perhaps the best diesel small car to drive today. So if you are in the market for diesel cars and driving experience is a big factor for you, here’s why the Figo should be your choice. The Figo it uses a hydraulic power-steering unit compared to the more common electric power-steering unit used in small cars. The hydraulic unit provides a smoother feel to the driver while providing just enough resistance in the steering wheel at different speeds to give the driver a feeling of control. The Chevrolet Beat diesel and Maruti Ritz diesel use electronic power-steering units, which are great at slow city speeds, but do induce a “video-game” like feel at higher speeds, with not enough resistance or “feedback” coming to the driver as to where exactly the front wheels are pointed. The Ritz, to its credit, does have a sharp steering response, which many appreciate – and that’s why it comes second in the poll too. The Indica, on the other hand, even though it used a hydraulic power-steering unit, the steering feels too vague. Figo’s slightly firm suspension set up is well-balanced and allows the driver to take turns at speed with confidence. The fact that the Figo is a low-slung car also helps in stability during turns. That’s also why the Indica is considered a bad car for handling – the soft suspension gives a feeling of instability to the car when driven at speed. Do you own any of these cars? Share your valuable feedback about your car here, and help others make better buying decisions. « Renault Duster variants and specifications explained!